Iran has deployed Revolutionary Guards units to Iraq, according to security sources in Tehran. Iran has deployed Revolutionary Guards units to Iraq in order to fight the Islamists who have taken over cities there, The Wall Street Journal reported on Thursday, citing Iranian security sources. The sources said that at least three battalions of the Quds Forces, the elite overseas branch of the Guards, were dispatched to aid in the battle against the Islamic State of Iraq and the Levant (ISIS), an offshoot of Al-Qaeda rapidly gaining territory across Iraq. 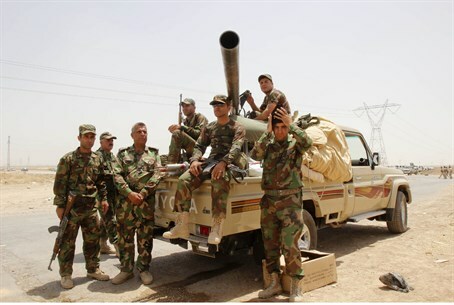 One Guards unit that was already in Iraq fought alongside the Iraqi army, offering guerrilla warfare advice and tactics and helped reclaim most of the city of Tikrit on Thursday, according to The Wall Street Journal. General Qasem Sulaimani, the commander of the Quds Forces and one of the region's most powerful military figures, traveled to Baghdad this week to help manage the swelling crisis, said a member of the Revolutionary Guards, according to The Wall Street Journal. If the report is true, it would make the second time that Iran has gotten involved in fighting in a nearby country. Iran is already involved in Syria’s civil war, where it has provided Syrian President Bashar Al-Assad with military support during his fight against the rebels. Former Iranian President Mahmoud Ahmadinejad personally sanctioned the dispatch of officers from the Revolutionary Guards to Syria to fight alongside Assad’s troops. Two weeks ago, The Wall Street Journal reported that Iran has been recruiting thousands of Afghan refugees to fight in Syria, offering them $500 a month and Iranian residency. Iran dismissed the claim, with foreign ministry spokeswoman Marzieh Afkham being quoted as having said they were “unfounded and is aimed at damaging Iran's reputation in Afghanistan”.